Fresh Fish Display Counters including Serve Over Fish Counters and Low Glass Fish Displays or Self Service, perfect for Commercial & Retail use fishmongers, supermarkets. The Display Counters are perfect for displaying a variety of Fresh Fish and Seafood. 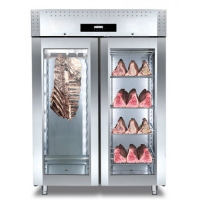 Our Refrigerated Display Counters are of High Quality, Made in Italy and come with Warranty, 10 Years After Care & Free Delivery! Seafood & Fish Refrigerated Serve Over Counter Our commercial refrigeration range of fish display counters includes serve over fish counters and low glass fish displays, and serve overs suitable for fishmongers, supermarkets and retails. The display counters are perfect for displaying a variety of fresh fish and seafood.The fish counter that catches the eye, thanks to the sophisticated and captivating lines of its structure and to the presence of a fully stainless steel display area.The serve over fish counter spherical tempered glass of the display are designed to create a pleasant visual continuity between the cylindrical legs support and the exhibition area. It is made with high quality materials and elegant finishing touches, as well as being customizable to fit small and large spaces.Fish Display Counter:Plate Evaporator with Ø 10 Copper Coil RefrigerationCurved Tempered Front Glass Tempered Side Glasses Micro-Perforated Coil for Daily WashingStainless Steel WorktopSeafood Display Counter :Plate Evaporator with Ø 10 Copper Coil Refrigeration Static Fan Refrigerating Element False Bottom Case with Pierced Panels made of AISI 316 Stainless SteelCurved Tempered Front Glass Stainless Steel WorktopDimmensions (L) x (W) x (H): 2800/3150/3400 x 1240 x 940 h mm.. Fish Display Counter with Granular Ice Flakes MakerOur commercial refrigeration range of fish display counters includes serve over fish counters and low glass fish displays, and serve overs suitable for restaurants and hotels. The display counters are perfect for displaying a variety of fresh fish and seafood.TECHINICAL DATAopeningmanualshelves1gasR 452Arefrigerationvoltage V/Hz230/50dimensions140 x 76 x 125 hweight Kg146certifications Cardboard Packagedimensions cm145 x 80 x 146 hweight Kg16..
Zoin Saigon Fish Display Self Service CounterOur commercial refrigeration range of fish display counters includes serve over fish counters and low glass fish displays, and serve overs suitable for fishmongers, supermarkets and retails. The display counters are perfect for displaying a variety of fresh fish and seafoodTechnical Details The Display counter is produced in AISI 316 stainless steel for the display of fish and sea food with working top made of granite. Static refrigeration with copper coil foamed in the basin bottom, with display surface with deck plates. With built-in refrigerating unit. Equipped with mechanic thermostat.It is available with curved glass or with self-service glass. Plastic pan for the collection of defrost water to be emptied manually. *optional glass divider..
Zoin Saigon Fish Serve Over Display CounterOur commercial refrigeration range of fish display counters includes serve over fish counters and low glass fish displays, and serve overs suitable for fishmongers, supermarkets and retails. The display counters are perfect for displaying a variety of fresh fish and seafoodTechnical Details The Display counter is produced in AISI 316 stainless steel for the display of fish and sea food with working top made of granite.Static refrigeration with copper coil foamed in the basin bottom, with display surface with deck plates. With built-in refrigerating unit. Equipped with mechanic thermostat.It is available with curved glass or with self-service glass. Plastic pan for the collection of defrost water to be emptied manually. *optional plexiglass closing/glass divider..